"" Writer's Wanderings: Brutus is Back!! It's just about time to unpack Brutus and set him up again. The first Ohio State Buckeye football game is August 30 against Youngstown State. Our neighbors know us as the people who put that inflatable in the front yard during football season. Most of them are intelligent enough to know that it is the Ohio State Mascot--except for the Michigan fan who lives down the street. The real Brutus has been around since 1965. Originally he was just a big buckeye made of paper mache (obviously not a good choice for outdoor weather) with holes cut for the student's arms and legs. The next year he was made of fiberglass. 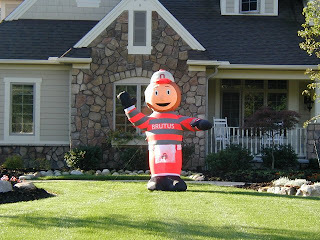 Eventually his appearance was updated to a large head shaped like a buckeye with a face and the scarlet and gray outfit with the block "O" cap. Brutus had the honor of being inducted into the Mascot Hall of Fame in 2007. As it says in his bio there, "As a nut, he of course, is the life of the party, and loves being with people – especially fellow Buckeyes!"